OK...here's my attempt to continue to be a little more regular with this blogging thing (and I am failing miserably). I spent time posting my music on Bandcamp and then writing about it and I have little more to go, but not a lot of new music (except for what Jay and I are working on). So, while I get my music act together (no pun intended) I thought I would write about my 4th of July camping weekend. We left later than I would have liked to on July 2nd to head up North to Casini Ranch, a family campground "nestled among beautiful hills resting on a gentle meander along the Russian River just minutes from the Pacific Ocean in Sonoma County, California. One mile of river runs along this 110 acre part of the ranch offering campers a memorable camping experience." We made a stop in Santa Rosa to pick up a canoe belonging to my wife's cousin's family. We arrived around 10:30 pm, set up camp and crashed. Fortunately my son was already sleeping in the car so the transition from car to tent was easy. The night sleep was a challenge. Three of us (my wife, son and myself) had coughs so we kept waking each other up with coughing fits. The lady in the site next to us had a little too much to drink and got sick in the middle of the night and there was a baby in another site that couldn't be consoled. Friday morning we woke up to the sound of voices above us (I thought it sounded like French kids). Next thing I knew my wife was outside telling the kids to scram. For a second I thought it might be my daughter and the daughter of the family we went camping with, but turns out it was some Latino kids that had climbed the tree above us and were just hanging out. After having breakfast and making lunch we made our way down to the river. Weather.com said it was going to be around 85 degrees over the weekend, but it was VERY foggy and cold. The wind was blowing, but the temperature in the river was nice. Raft into the river. Canoe into the river. Time for some swimming and boating fun. Well, except for the fact that once my son and wife got into the canoe I pulled it out into the river, stepped in and capsized the canoe sending all of us into the river. My son was crying and I felt pretty ridiculous. We sat on the bank of the river, trying to dry off and warm up. We enjoyed a picnic lunch and watching the kids play in the river. My daughter got to try her hand at skipping stones. That evening we played a card game called Munchkin (check it out here) had a great dinner - campfire - s'mores. Good time. Our night sleep was again challenging - more coughing - more crying baby...so that morning after a total lack of sleep I decided to take the kids down to the river for a walk so that my wife could sleep and so that we wouldn't disturb the family we were camping with. The mist on the river was amazing (I wish I had brought my camera). It was very peaceful. Folks walking their dogs. Birds swooping over the river to catch bugs for breakfast. We skipped stones (my son enjoyed tossing them into the river). On our walk we saw something that was probably a caterpillar, but could've been a millipede. We watched it for a while - my son REALLY wanting to touch it. We finally made our way back to camp and had breakfast. 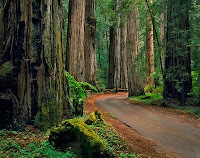 We decided to go on a hike so we headed off to Armstrong Redwoods State Reserve (here). The day was perfect for hiking and we set out. The first hike (more of a walk) was great and after we were done we decided to try a more strenuous hike. We were a little worried that my 3 year old son might not be able to do a big hike, but figured we'd try. He amazed us. I think in total we hiked 6 or 7 miles and he lasted for all but .5 of it (the last flat ground after we were technically done). We were thrilled. Hiking is a testing ground (in my opinion) for a child's ability to go to a theme park. My daughter proved that when she was younger by hiking with us at Arches National Park (here). It was a brutal day in Moab - really hot - and we managed to see some of the less seen arches. At one point we looked around and found only adults where we were. My daughter was a real trooper that day...must've been quite a few miles. After hiking we decided to get some dessert (before dinner) so we visited Flavors Unlimited (located at 16450 Main Street in Guerneville). Their concept pre-dates Coldstone in that you select a type of ice cream (chocolate or vanilla) and what you want to mix in. Then they throw it all into this huge machine that has a drill (or so I've read "blender-swirly-drill-to-the-center-of-the-earth kinda machine" on Yelp) and out comes a perfect blend of ice cream and toppings. Totally rocked. My son passed out on the way back to camp (which was great since he hadn't had a nap or good night sleep the entire time). We got dinner ready and the kids (minus my son) went on a hayride around the campground. They had fun shouting and cheering. It is the 4th of July after all! Dinner was followed by more campfire and a yummy peach cobbler made in the dutch oven. The next day we got up and broke down camp. My wife's cousin had told us about a great breakfast spot called Cape Fear Cafe (25191 Main Street, Duncans Mills, CA) and we had a spectacular brunch. After dropping off the canoe we borrowed in Santa Rosa we headed back home, unpacked, aired everything out and had a late lunch. It was a great 4th of July weekend camping. We all had a great time camping with the other family. OK...this post has taken me over a week to get together...I think I'm done.